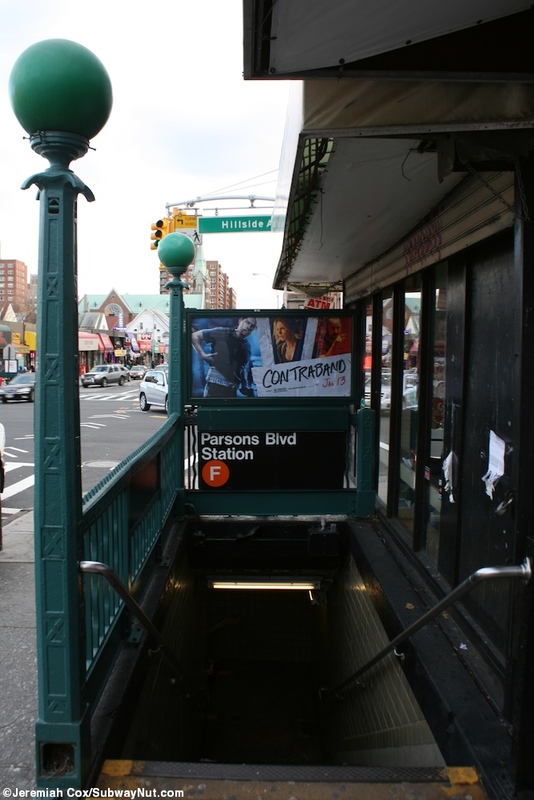 Parsons Boulevard is the last express stop on the Queens Blvd subway here beneath Hillside Avenue, it is a typical IND express station with two fairly narrow island platforms. 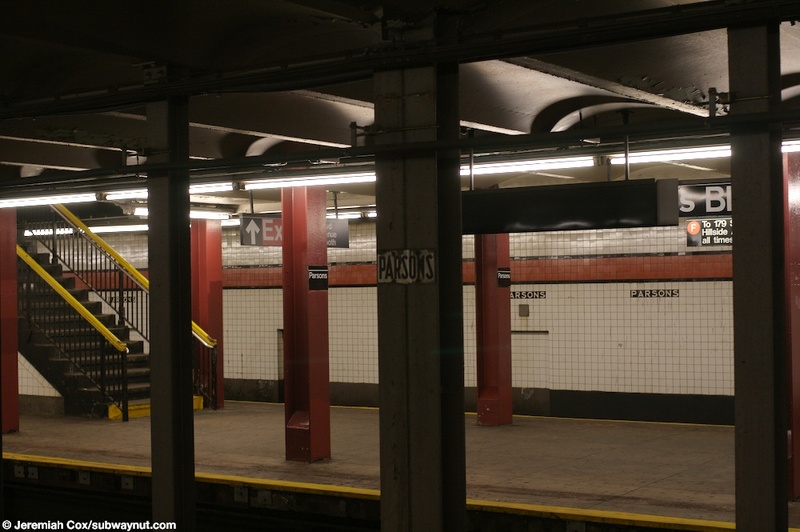 These have maroon-red painted columns (that also exist on the mezzanine) and an orange trim with a black border along the platform walls, and Parsons tiling one tile underneath the trim. 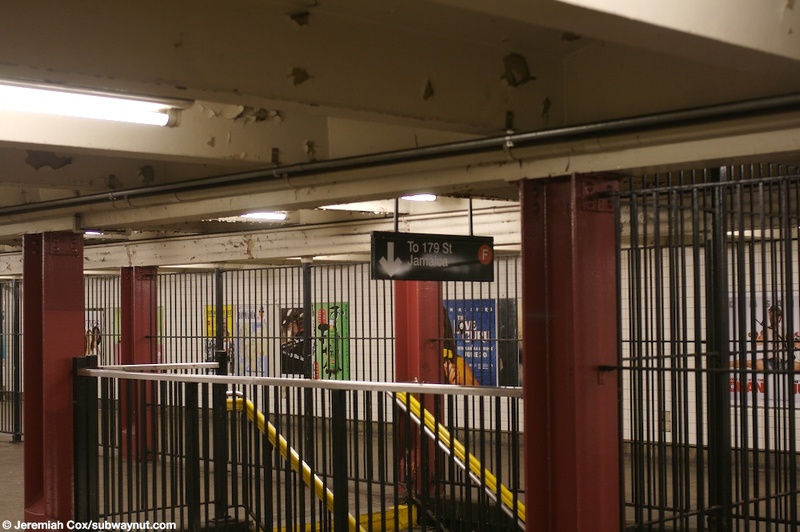 The stop has basically a full length mezzanine that is both within fare control between the two exits but there is also an out of fare control connection between the two exits via a narrow fenced off passageway on the south side end of the mezzanine. 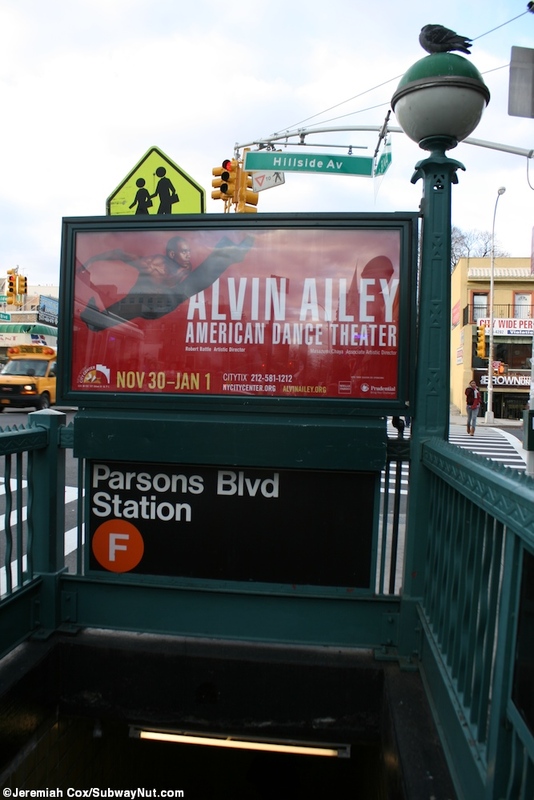 At the western end of the station is the full time token booth where it faces the turnstiles near three staircases down to each platform and there are streetstairs out to the NE, SE and SW corners of Parsons Blvd and Hillside Avenue. 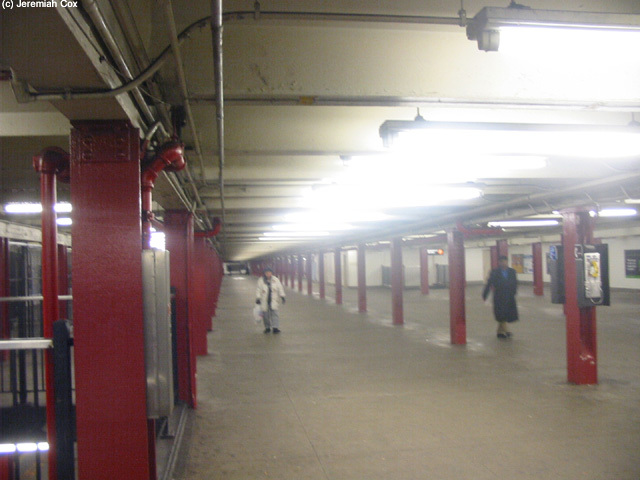 Towards the southern ends of the platforms there are two more staircases up to the full-length mezzanine. 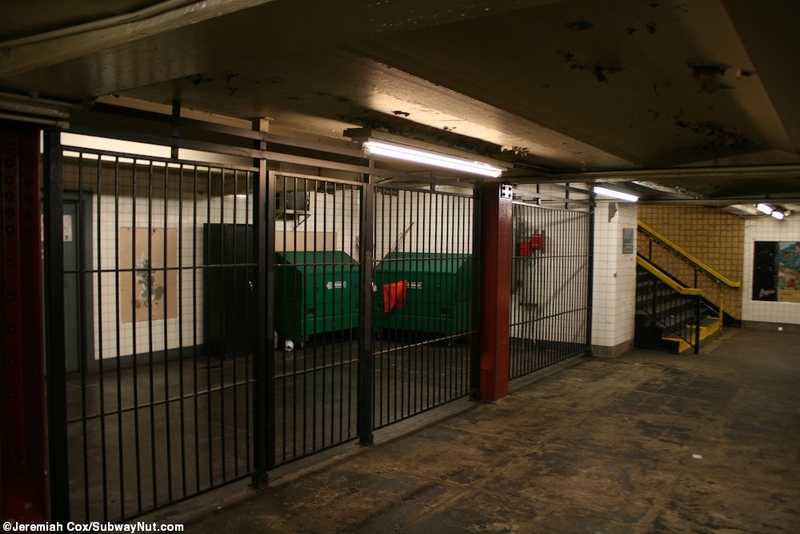 These lead to two High Entrance Turnstile plus an exit only one (and TVMs). 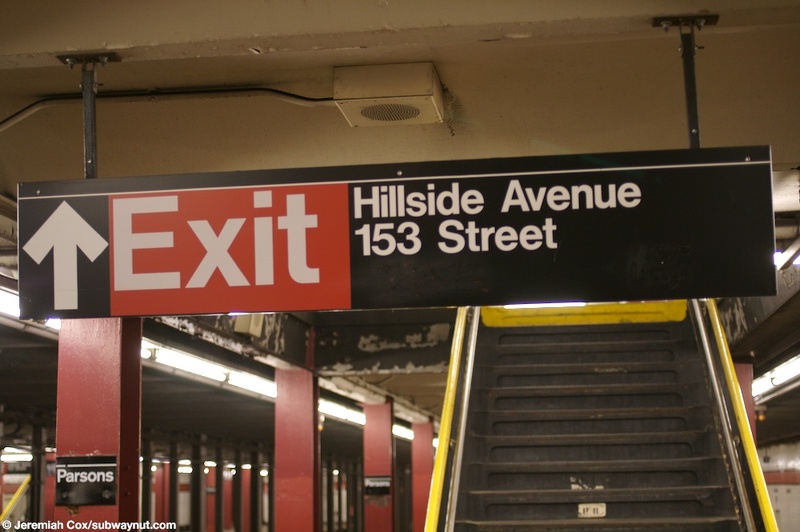 Here their are short, separate passageways lead to streetstairs to the SE and SW corners Hillside Avenue and 153 St (this passageway has faded painted text for the change booth) and a single one on the northside of Hillside Ave since 153 St ends. 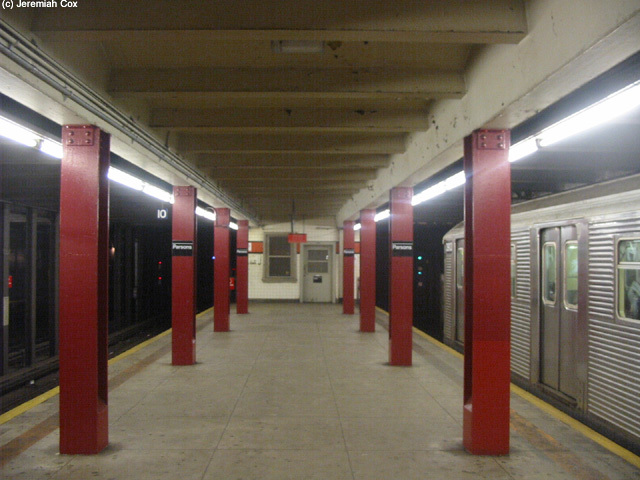 (parsonsf1) Looking down towards the very end of the Jamaica-bound platform at Parsons Blvd. 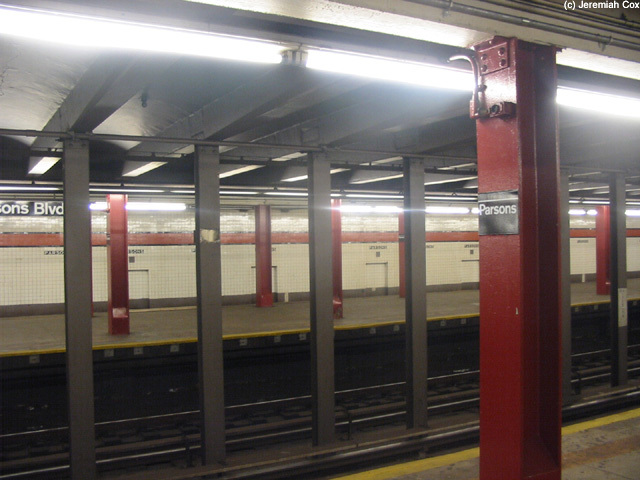 9 February, 2004 (parsonsf2) Looking across the express tracks at Parsons Blvd. 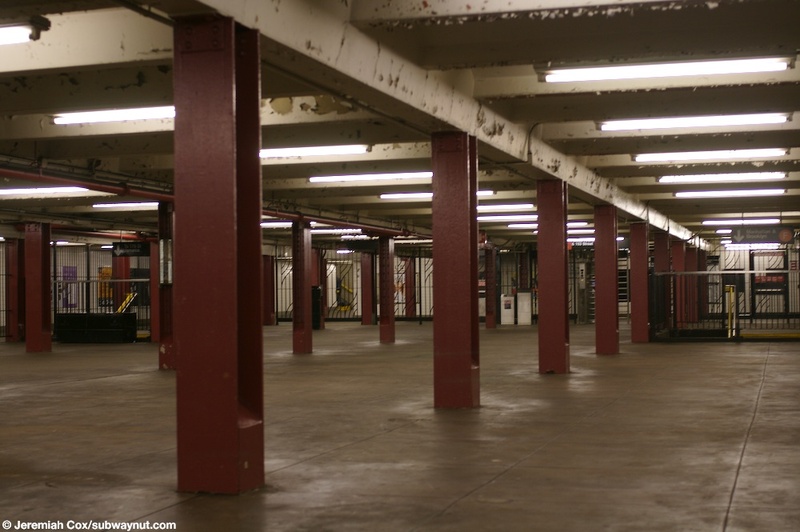 9 February, 2004 (parsonsf3) Looking down the long mezzanine at Parsons Blvd. 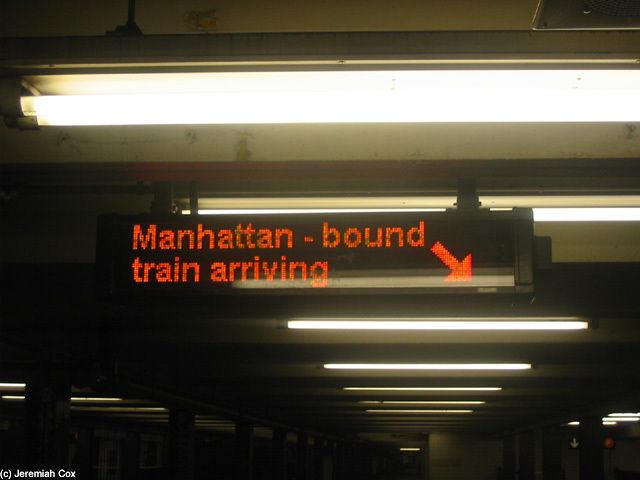 9 February, 2004 (parsonsf4) A modern dot-matrix sign that is identical to the useless ones that only seem to say the date and time along the platforms flashes and beeps saying a Manhattan-bound train arriving at Parsons Blvd. 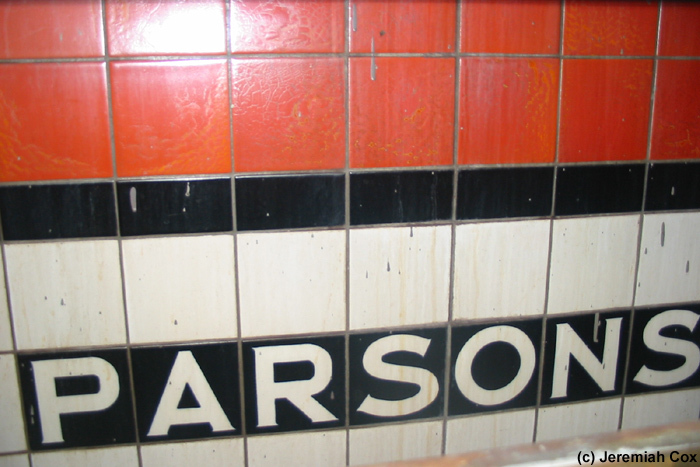 (parsonsf5) A rare close up view of the Parsons tiling and trim taken out the window of the R1-9s running in service due to the Subway Centennial. 26 September, 2004 (parsonsf6) A close up of the 'parsons' text on a column at Parsons Blvd. 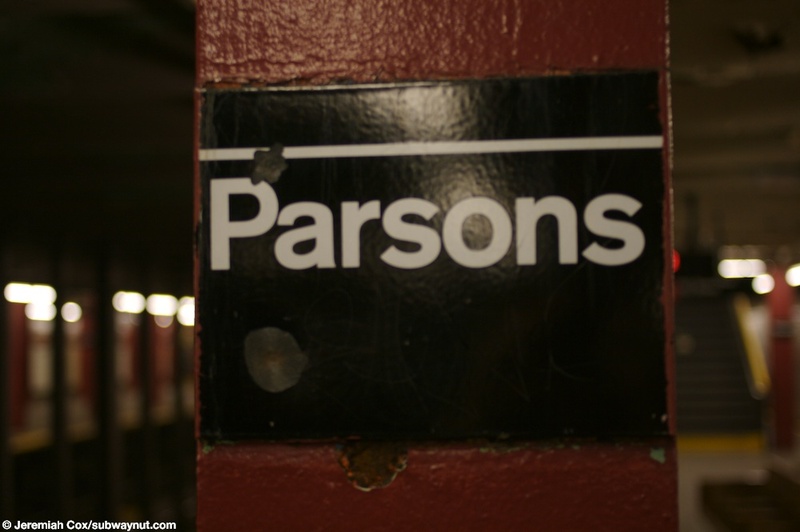 2 June, 2008 (parsonsf7) Original, now very dirty, black lettering on a white background 'Parsons' signs are still intact along the columns between the express tracks. 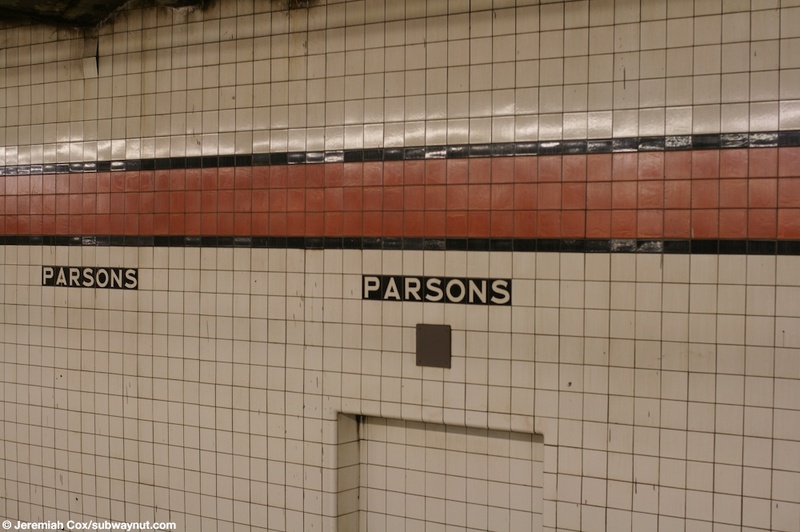 2 June, 2008 (parsonsf8) The orange wall trim that's three tiles wide and the 1/2 tile black border with Parsons letting one full tile below it along the local track walls at Parsons Blvd. 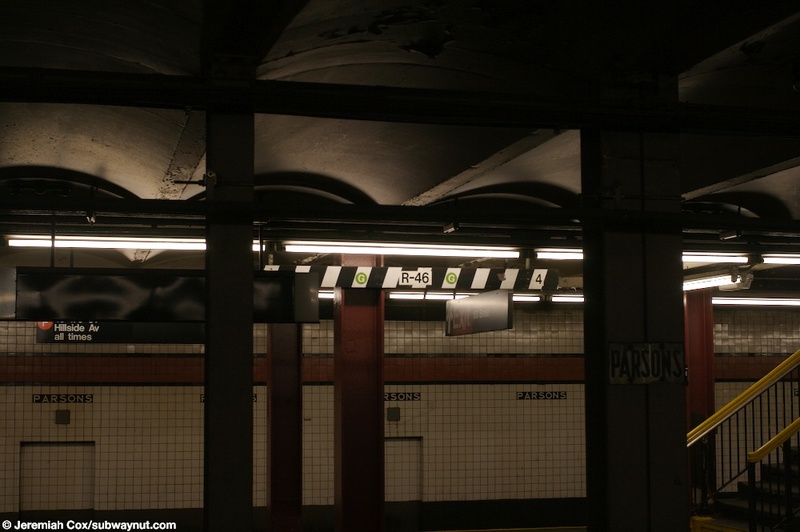 (parsonsf9) Looking across to a conductors stop point for a 4 car R46 G train on the Jamaica-bound express track at Parsons Blvd. 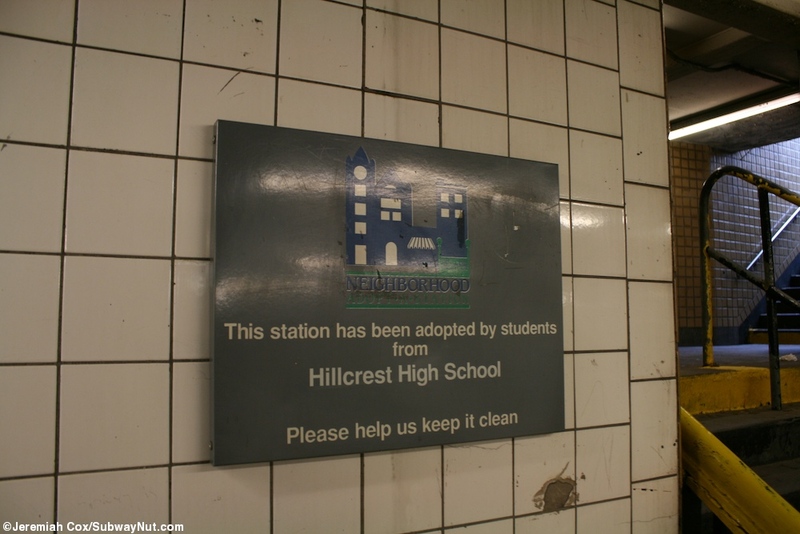 2 June, 2008 (parsonsf10) A sign for a staircase up to the Mezzanine and the exit to Hillside Avenue/153 Street at Parsons Blvd. 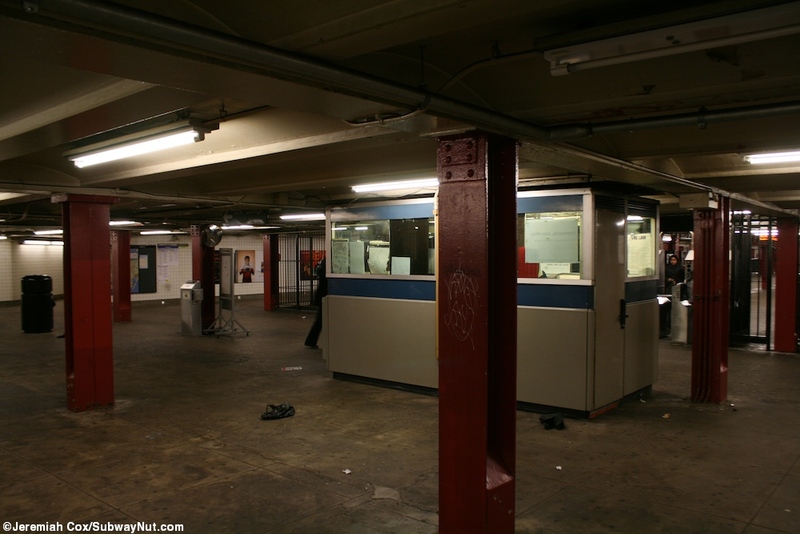 2 June, 2008 (parsonsf11) A view down the mezzanine to the HEET exit to 153 Street at Parsons Blvd. 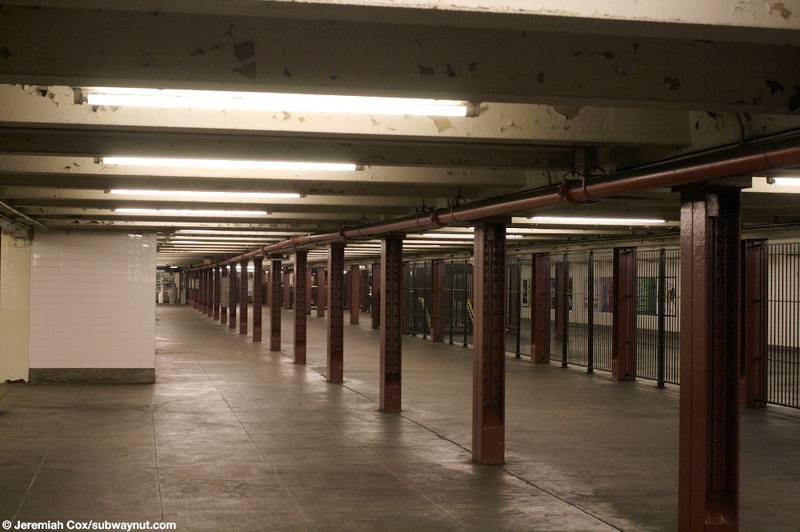 2 June, 2008 (parsonsf12) Another view down the mezzanine at Parsons Blvd where it gets narrower where it looks like rooms (the tile whiter then in the rest of the station) have been carved out of the mezzanine over the Manhattan-bound tracks at Parsons Blvd. 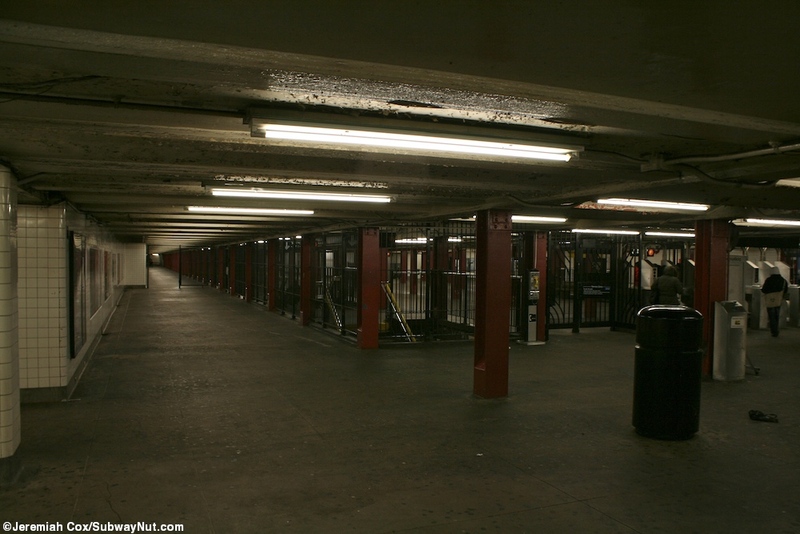 (parsonsf13) A staircase down 'To 179 Street' with the black fence that separates the corridor that leads between the two entrances to the station outside of fare control visible behind it. 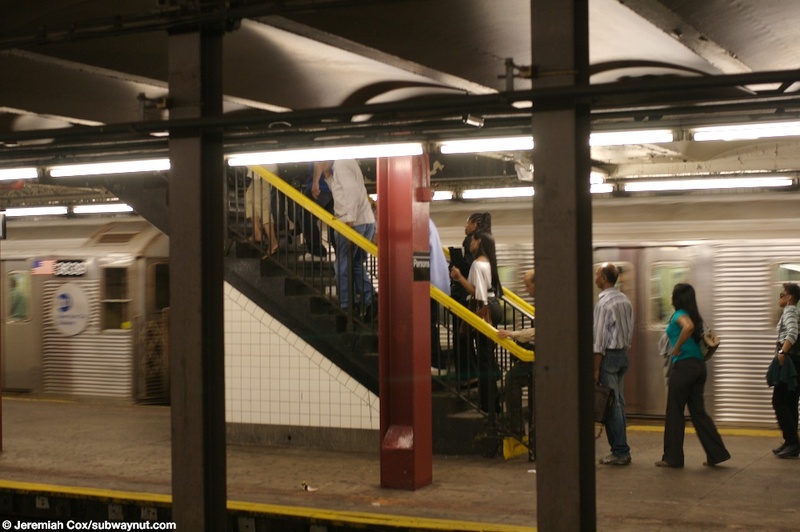 2 June, 2008 (parsonsf14) Passengers disembark from a Jamaica-bound F train coming home during the evening rush.